Our wedding videos are a boutique and tailor-made keepsake, beautifully filmed and crafted by our award-winning film-maker and designed to capture the unique essence of you and your special day. We have a number of packages available below, all of which can be customized to your specific wishes and needs. Let’s talk about designing a personalized package just for you. 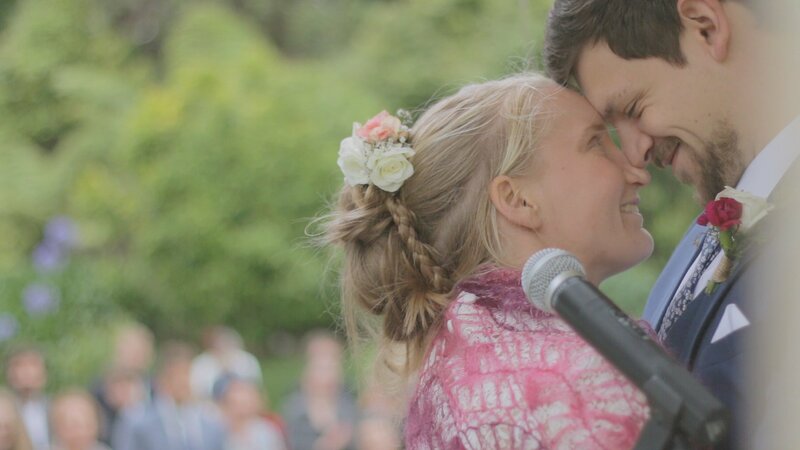 Rachel captured our wedding day in such a special way – she really did discover the essence of who we are and what is important to us, and that came through beautifully in the finished film. We loved how Rachel worked so well with our photographer, and how she managed to record so much of our day with us hardly noticing she was there. Highly recommended! Pre-wedding meetup so that we can get to know each other and discuss plans for your ceremony. 2 consecutive hours on-site filming at your wedding ceremony covering guests arriving and mingling, your magical ceremony, your formal photo session and focused bride and groom interactions. 1 x 3-4 minute ‘Ceremony’ video, a highlight video focused around your beautiful ceremony , mixed with coverage of your guests, your formal photo session and bride and groom interactions. Delivery of HD digital files on a unique, tailor-made, wooden USB. 6 consecutive hours onsite filming covering your choice of events throughout the day, from the bridal preparations through to the first dance. 1 x 4-7 minute wedding film that highlights the special moments and the joyful essence of your day. 8 consecutive hours onsite filming coverage from bridal preparations until the first dance, including some couple-to-camera time for that really magical touch im your finished film. Attendance at your wedding rehearsal. 1 x 5-10 minute wedding film that highlights the special moments and the joyful essence of your day. 1 x ‘Your Special People’ reel; a collection of personal messages from beloved friends and family which can either be a standalone or woven into your wedding film. An additional booking fee of $95 applies to all of the below packages to secure your booking. Capture the heart of your special day in a unique and stunning video. A treasured keepsake of your wedding day; a film covering highlights of your special day. A boutique collection covering highlights of your day, your ceremony and your treasured family and guests.